So here’s how it can be valuable. Say you’ve built an ArcFM Geodatabase and assigned trace weights. 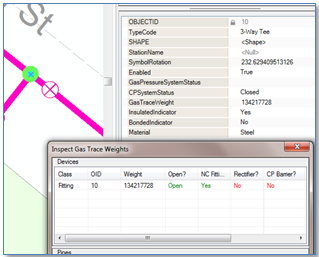 In the process you’ve discovered that a subset of features have had the trace weight value assigned incorrectly (you might have either used the ArcFM Feeder Translator or the Gas Trace Weight Inspector to do this). On examination you find there was a missing or mis-assigned model name – for example, say the INSULATEDINDICATOR model name was missing from your NONCONTROLLABLEFITTING class and thus gas cathodic protection traces don’t stop at insulated fittings as they should. You could open an edit session and change the value of a field that drives the trace weight – making sure you change it back and you don’t save your edits. Alternatively, you can simply set the trace weight field itself to 0, <null> or any other value. That is jiggering the trace weight. If your new configuration is correct the new trace weight will be re-calculated without impacting any other fields. Of course this can be done to a single feature or multiple selected features. And while the example we present is for a gas fitting it works with any ArcFM trace weight field assigned to any utility domain feature class. OK, this technique is not going to cut you workload in half, get you a raise or bring about world peace, but it might be a handy thing to know and use from time to time.